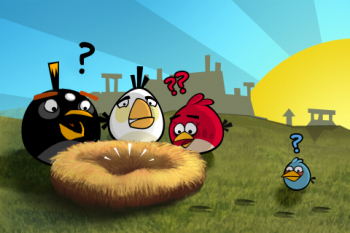 According to Rovio Mobile, even those who pirate Angry Birds merchandise can add to the brand's value. It's almost impossible to say something uncontroversial about the piracy of videogames. Is it theft or copyright infringement? Is it morally permissible or reprehensible? Is piracy an act of laziness, malice, or rebellion? Game developers, in general, are not happy about people enjoying their products without paying, but there's always an exception that proves the rule. Rovio Mobile, the company behind a little-known underground game called Angry Birds, isn't thrilled about pirates, but acknowledges that piracy doesn't have to be a complete loss. Rovio believes that even though it will lose money through pirated games and goods, any new Angry Birds fan is a welcome one who may be willing to pay up in the future. "We could learn a lot from the music industry, and the rather terrible ways the music industry has tried to combat piracy," says Mikael Hed, Rovio's CEO. "[We learned] to stop treating the customers as users, and start treating them as fans." Since the game is available for free on a number of platforms, fans may wonder where piracy enters into the mix; after all, pirating an already-free game seems counterintuitive. Hed explains that Angry Birds suffers more from unauthorized merchandise, especially in Asia. Instead of trying to alienate customers with pirated apps or merchandise, or pursue them in court (which Hed describes as "futile"), Rovio has decided to embrace them. "If we lose that fanbase, our business is done, but if we can grow that fanbase, our business will grow." There's no question that unauthorized merchandise and apps are costing Rovio money right now, but Hed seems to be taking the long view. "Piracy may not be a bad thing: it can get us more business at the end of the day." Of course, Angry Birds is more popular and profitable than a number of world religions at this point, so unlike many developers, Rovio can afford to withstand some piracy in the present to expand its fanbase for the future.